PETER SLEN: Steve Emerson is the Executive Director of the Investigative Project on Terrorism. Mr. Emerson, if you could start by telling us what that is. STEVEN EMERSON: It's an organization I founded in 1995 to track the activities, investigate the operations of radical Islamic groups on American soil and their ties to international terrorism overseas. It followed the production and broadcast of a documentary that I had done in 1994 for PBS called "Jihad in America." So the Investigative Project on Terrorism-now 15 years old-has amassed a repository of close to five million documents, 50,000 hours of recorded video and audio of radical Islamic groups' gatherings and conferences; as well as many other types of data. SLEN: Why did you start this project in 1995 or start the documentary in '94? EMERSON: Good question. I had been a reporter for CNN in 1993 and right after the first World Trade Center bombing in February, '93, CNN asked me to do a documentary on the roots of that bombing. I already had some prior knowledge of the extent to which radical Islamic groups had morphed from being anti-Soviet jihad groups in the U.S. to being anti-American groups. Like Hamas, like Islamic Jihad and I proposed back to CNN about how we do a documentary about how the radical Islamic groups on American soil had morphed into legitimate groups under false names and fake monikers. They did not want to do that. So, hell hath no fury like a journalist scorned. I quit. I took my documentary to public television. They gave me some seed money; I raised the rest of the money and I did a documentary called "Jihad in America" that had a lot of video of undercover radical Islamic gatherings in the United States from Boston to California calling for Jihad. And after the film was done, I realized that there was nobody tracking these groups. The FBI wasn't tracking these groups; they were all below the radar screen and if they weren't doing anything illegal, except rhetorically calling for the death of America. There was nothing they were doing that was violating the law. So I formed this organization to track them and we see now that many of the groups were formed out of the Muslim Brotherhood which was an organization that was created in the 1920's in Egypt that believes in the imposition of the Sharia, or code of Islamic law. SLEN: How long have you known about Colleen LaRose? EMERSON: I've known about her a little bit before it was announced in the papers that she had been arrested just the other day. She had been arrested actually October 29th; that was not disclosed publicly. It was only disclosed this past week that she had been arrested and charged with I think, seven counts, including one count of material support, another count of conspiracy to murder, another count of false documentation and then lying to the FBI. I am plugged into a number of other groups that track radical Islamic activity on the internet. SLEN: And, so did you know about "Jihad Jane?" Had you been tracking her at all? EMERSON: We had not been tracking her. We've known about her and some other names of people that are quite open and amazingly open on the internet in terms of soliciting support. Now some of them could be fake names designed by law enforcement to illicit would be Jihadists. Others are real and we've tracked or at least followed some of those names. SLEN: And there is an article this morning in the Los Angeles Times saying "Internet making it easier to become a terrorist." Do you agree with that and how so? EMERSON: I think it's true. I think that it's the reverse of the global village. You can bring in the actual ability to communicate with any terrorist overseas right into your living room into your computer. You can raise money by offering to become a Jihadist. So the internet has really made this instantaneous ability raise funds, recruit, become part of a conspiracy without ever leaving your home. Now of course, at some point, if you're going to become an active jihadist and carry out an act of terrorism, you're going to have to leave your home as Jihad Jane did, when she traveled once to Ireland and once to Sweden to track the activities of the Swedish cartoonist who she volunteered to help assassinate. SLEN: Has homegrown terrorism grown in the U.S.? EMERSON: Good question. Absolutely. There is no doubt that homegrown terrorism not affiliated-there are two types of homegrown terrorists. Ones that are being directed externally by Al Qaeda. Others like the most recent arrest of the man who was going to blow up himself on the New York City subway system. Or others like Daniel Boyd out of North Carolina or Jihad Jane who are not affiliated at all with external groups but become mobilized and radicalized in the United States. In fact, in 2009 there were 15 successful or unsuccessful terrorist attacks by jihadists. Nine of the 15 were carried out by non-Al Qaeda homegrown terrorists. The largest number we've seen since 9/11. So we're definitely seeing a rise in homegrown Islamic terrorism. People who are not affiliated but who get radicalized either through the internet, through either local mosques, through videos or through charismatic jihadists who prevail upon them to carry out acts of terrorism. SLEN: And in fact, Eugene Robinson this morning in his column in the Washington Post says forget about Plain Jane and says that any efforts to profile airline passengers would be failures and Colleen LaRose is an example. EMERSON: One thing that he is right about is definitely having an American passport is definitely key to being able to travel overseas without engendering the same suspicion as you would engender if you had, let's say a Yemenis or Nigerian passport. But I will say this, still 95 percent of the homegrown jihadists still fit a certain type of profile and while, Jihad Jane did not, because she was a white convert, 46 years old. She escaped that quote stereotype but the other ones did not. And so a certain type of profiling which is a law enforcement technique which has become a dirty term, but it's used all the time, you look for the common denominator. And so the common denominator, let's say last year of the 15, let's say homegrown plots, were male, between the ages of 19-36 and Muslim. That would be a sort of law enforcement profile. You would obviously include other factors such as their visits overseas, whether they went to Gaza, whether they went to Nigeria, whether they came from Nigeria, whether they went Yemen. So you don't want to use only racial profiling as a means but you want to include that criteria to help give you more insight into who might be a jihadist. SLEN: Steve Emerson is our guest. He is the Executive Director of the Investigative Project on Terrorism. Calls have been up, St. Louis, Missouri, Pat, Republican. Hi. CALLER 1: Good morning. Mr. Emerson, I've seen you many times and I admire your work and your dedication to bringing this out into the open because I think too many Americans just assume if you're Islamic-if you follow the Islamic religion, you're peaceful like the Christianity or any other religion. But there's a component of it that doesn't promote peace and I think it's important that people realize this and I think a lot of us do but because of a politically correct society we live in, we can't voice our opinion. And I remember one time, you talking about how the FBI was hamstrung and could not get into mosques to investigate some of the Imams who preached this hate, and I think anybody in this country who preaches hate, the destruction of America or the killing of innocents should be kicked out if they are not American citizens. EMERSON: Well I tell you, the fact is that preaching hate and let's say calling for death to America or death to Jews or death to Christians, that is protected speech. That's not something that is actionable by the FBI so in fact that is one of the reasons why my organization, the Investigative Project on Terrorism was created so we could track the rhetoric, the extremist hate rhetoric coming out of various Islamic leaders but which the FBI could not track, could not use, could not collect because it was protected speech. The FBI can only get involved if there is a criminal predicate to carry out acts of violence. And its my belief that we need to track some of the statements made by some radical leaders in order to show that they're not as peaceful as they would be portrayed in the regular American media when they make statements that were are against terrorism but behind closed doors they make other statements that are totally contrary to that message. SLEN: How much of your work is done on the computer? All of it? EMERSON: No. We're operational. I'd say we collect a lot of materials from the internet and then we do a lot of analysis on the computer but to be honest with you, the real material-the heart and soul of the material we collect, is done through undercover operations in which we send people in to actually tape record or video record Islamic radicals making speeches calling for death to America or support for terrorism. So there's a need for going into the field. You can't avoid that. Now of course you can buy videos and audios on the internet but generally speaking, those living in America, especially some of the savvy Islamic militants-and I'm not at all including the entire Islamic community. I'm talking about Islamic militants. They're savvy enough to know that they shouldn't be putting out stuff that is radical on the internet. They do however say things behind closed doors. In fact, just yesterday in the Virginia House of Delegates, there was an Imam, Johari Malik from Dar-al-Hijrah mosque who convened the opening of the Virginia State Delegates Assembly. He was recorded by us, my organization in 2000 as calling for the bombing of power plants and other bombings in Israel and also in 2004; he made a statement at Dar-al-Hijrah mosque where he is an Imam saying that Islam will reign supreme. So, we felt that was important to get out because he was being portrayed as this wonderful, peaceful interfaith dialogue type of Imam but in fact he had made radical statements including defending known Islamic terrorists. SLEN: Do you work with law enforcement? EMERSON: Yes we do. We have no financial ties to them. We're totally supported by the American public, we don't take a dime of money from the government but we do work with law enforcement agencies. SLEN: And when you say the American public, you mean by donations not tax dollars. SLEN: Landover, Maryland, Tony, Independent line. Please go ahead with your comment for Steve Emerson. SLEN: So Tony, given that you think that this is based on lies why do you think that that process happened? SLEN: Alright, Tony. We're going to leave it there. We got the idea. EMERSON: Well, let me just say this. There's a conspiratorial tone to that question. I reject it entirely in the same way that I would reject the notion that members of the Klu Klux Klan were arrested because they were put up to it in some type of fabricated way. There's absolutely no question whatsoever that terrorism exists and that its not limited, necessarily to radical Islamists, there are known Klu Klus Klanners, Timothy McVeigh was a terrorist. But in the last ten years, 95% of the terrorism carried out against the United States has been carried out by radical Islamists. And they haven't been manufactured or anything. They do it because they believe that the U.S. deserves to be punished for a variety of reasons. SLEN: Do you worry about your safety? EMERSON: That's an interesting question. I experienced a major problem back around a decade ago, actually a little bit more than that when I was subject to an assassination plot. Now I live under false cover in the Washington, D.C. area. And I sort of-I watch my back a bit. We frequently we get tips from law enforcement that there our names heard on wiretaps by terrorists. So we're careful, but it hasn't deterred us. SLEN: Next call for Steve Emerson: La Fargeville, NY, Noel, Republican, hi. CALLER 3: Hi, how you doing? Listen, I have been an airline pilot for years and years and the one thing I do know is that El Al is never – you never hear about them having a problem. Of all the people that should have it, they don't. And the reason: they profile like it's going out of style and boy, rock on with the profiling – I think it's a great idea. This country sticks its head in the sand and it doesn't want to acknowledge the obvious which is, uh, that profiling works. And until we start getting that through our heads, we're going to have more and more problems and it's just going to continue and that's just the way it is. Thanks. EMERSON: After the Christmas Day would-be bomber plot, there was a lot of discussion, which I participated in about profiling. And what I called for is "smart profiling" – that is that you don't just pick somebody out because they're Muslim, or because of religious identity, but you include that factor into a larger mix of information, such as visas, such as where they were coming from, such as the school they may have graduated from, such as any other factors that might be in the database. So you have a large database to include, on which you can make your judgment about who gets a visa and who gets secondary treatment at an airport, and who even gets an airline ticket. That's what those watch lists are all about. They are basically based on some type of profiling; the question is how much data do you include? And my belief is that you include religious factors into that mix, so as to help you make that decision. It doesn't always work, because as we see with "Jihad Jane" if she walked around without showing that fact that she had converted to Islam, she would have never been included. However, there may have been more information about her conversations on the internet with known jihadists that would have helped somebody make a decision: let's not allow her to make a trip to Sweden in order to carry out the assassination of that Swedish cartoonist. SLEN: Do you think it would be politically feasible to include religion on a passport or in the passport information? EMERSON: No, no I don't think so. SLEN: But that's what you would like to see that you said, right? Correct? EMERSON: No, I'm not saying I want to see religion included on the passport. I'm saying that if we know someone's religious tendencies in a database, then we can include that into a mixture of how we decide – of information on which we decide whether somebody gets secondary inspection. But I do not believe you should include religion on the passport. SLEN: Do you think that American passports should be harder to get? EMERSON: Well, if you're an American and then you marry someone from Nigeria, your spouse then gets an American passport. In fact, with "Jihad Jane" she offered to marry someone from Africa, apparently, who was going to be participant in the conspiracy to carry out the assassination – he would have gotten an American passport. So should we tighten up some of the regulations? Yeah, I think we should probably tighten up some of the scrutiny of those who are getting passports. SLEN: Next call for Steve Emerson, David in New York City – Democrat. EMERSON: I don't think one negates the other. No doubt that I believe that the person who flew the plane into the office building should have been classified as a terrorist. But it doesn't mean that we should not classify radical Islamists such as Nidal Hasan, the Fort Hood shooter, and, in fact, surprisingly so, the Obama administration won't allow the PATRIOT Act to be applied to the Fort Hood prosecution, which has really stymied prosecutors. And they are not charging him with terrorism. And I believe that that act, in which he killed 13 individuals at Fort Hood was predicated on his belief that radical Islam mandated him to do so, and that was an act of Islamic terrorism. SLEN: Uh, tweet in from Sasha. Do you think Jane needs to go to Gitmo? Mr. Emerson? SLEN: Do you think "Jihad Jane" needs to go to Gitmo? EMERSON: No, I do not believe she needs to go to Gitmo. I think that she – the evidence that they have collected so far, retrieving all the email messages, her itinerary, her passport, her computer provides substantial enough evidence to convict her in civilian court. SLEN: How sophisticated was her operation? EMERSON: Very unsophisticated. Let's just say there were people following her long before I was following – or even got information about what she was doing, number one. And number two, she didn't hide at all her wishes and her desires to carry out jihad, to recruit money for jihad, to recruit men and females for jihad, to carry out an act of terrorism overseas. I mean it was blatant. She only hoped that the avalanche of so many people on the internet would have hidden her identity and make it more difficult to retrieve her as a known terrorist. But she certainly was not sophisticated at all. SLEN: Next call for Steve Emerson. Flip in Tarrytown, Louisiana – Independent. CALLER 5: Yeah, it's not so much what this man says, it's what he does not say that expose the real agenda. What he does not say is that the leaked documents show that the Homeland Security was set up to – against Americans. What he does not say is the MIAC [Missouri Information Analysis Center] Report show that, uh, it was set up against Americans. SLEN: Flip, where are the leaked documents coming from? EMERSON: No, I would disagree. Homeland Security was set up to protect the homeland and it doesn't make a distinction between jihadists or white supremacists or – ok, that's number one. Number two – and this is a point I should have said before – there are two types of jihad that we track. One is the violent jihad – those that would carry out violence here in the United States. And the other is the stealth jihad, which is the jihad by which radicals insinuate themselves – infiltrate and penetrate U.S. Government institutions, academia, journalism – and I know that sounds conspiratorial, but based on documents we have posted on our website and that came out through the case of the Holy Land Foundation trial – the HAMAS trial in 2008 – it was revealed that there was a Muslim Brotherhood plan starting as early as 1991 to basically have a "Civilization-Jihadist Process" in the U.S. to infiltrate institutions of power to create a situation in which radical Muslims would have much more power politically without having to carry out violence. SLEN: Have you been accused of being a "conspiratorialist" in the past? EMERSON: I have been accused of many things, ok; that may be one of them. But I'm an empiricist – so I don't make judgments on the basis of theories, or concoctions, or presumptions, I base it on documents. So the documents that we have, and which were released in the Holy Land case, show a plan to establish a Caliphate, they show a radical Islamic Muslim Brotherhood plan in the United States. Not all of it has been realized. But we'll be coming out with a documentary in the next couple of months that will reveal the documents, and we'll have interviews with FBI officials – and with Muslims – who will talk about the stealth jihad and how they have penetrated, or try to penetrate, institutions of power in the U.S. Again, I'm not a "conspiratorialist." I deal with the facts and will have a website set up, which will have the documents in black and white for anyone to scrutinize. SLEN: After 9/11 there was a professor at, I think it was, Southern Florida University. What's his status? EMERSON: Sami Al-Arian. Actually he was a professor of engineering at the University of South Florida in Tampa. I profiled him – or at least I interviewed him – in my documentary in 1994 and concluded that he was head of the [Palestinian] Islamic Jihad in the United States. After 9/11, he was indicted and a trial was held, and in the trial half of the charges he was acquitted on, the other half there was a hung jury. He ultimately plead guilty to one count of material support. He served his time and is now being held under house arrest in Virginia for refusing to testify before a Grand Jury investigating Islamic terrorist ties in the Northern Virginia area. EMERSON: Because there was an organization called the Islamic – International Institute for Islamic Thought (IIIT) that has a whole labyrinth of Islamic charities in which DHS, the Department of Homeland Security, issued an affidavit back in 2002 saying that they were supporters of radical Islamic terrorism, including Al Qaeda and Hamas. And so, this Grand Jury was convened in order to examine and investigate the ties between this group in Northern Virginia and other radical Islamic groups, such as the group headed by Mr. Al-Arian in Florida, which was the Islamic Jihad. SLEN: Huntington Beach, California. Margaret – Republican – you're on with Steve Emerson. Please go ahead. CALLER 6: Yes, what about the Zionist groups who say "death to Arabs." You know you shouldn't even be on here – you shouldn't even have the position you have; you are very anti-Semitic. I'm of Middle Eastern descent; I am Semitic, you are not Semitic. Ok? And I'll tell you about the trial. Khalid Sheikh Mohammed – they don't want to try him in New York because he'll tell the truth. The motivation behind 9/11 was for our support for Israel and the oppression of the Palestinians. And if you knew – you know what our money is doing over there. EMERSON: Some of the conspiratorialists are coming out. Khalid Sheikh Mohammed was part of 9/11. He was the mastermind. They carried it out because they wanted to destroy, or at least hurt, the United States. And again, my agenda here is to root out the radicalism that affects the United States either by terrorism or legal insurgency. Look, I could have had an operation that looked at all types of terrorism – ETA [Euskadi Ta Askatasuna], animal rights terrorists, eco-terrorists, Japanese Red Army. I don't have the funds to do that. And there are other groups that do. Southern Poverty Law Center looks at the Ku Klux Klan. So we decided to create a group that looks at radical jihadists and, uh, we have done a fairly good job. If one goes to our website, which is – I just have to mention it – it's www.investigativeproject.org. SLEN: And we've been putting it up on the screen. 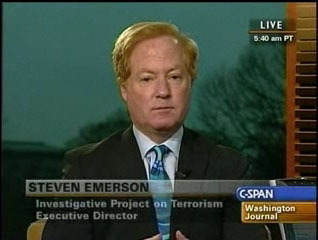 Steve Emerson is the Executive Director of the Investigative Project on Terrorism. Mr. Emerson, we had 3 or 4 very sincere callers who you labeled or could be labeled as conspiratorial. What do you say to them? They were very sincere in their beliefs. EMERSON: Listen, let me give you an example of the problem. After 9/11 I spoke at a law school, and at the law school I was being heckled, and I didn't know what to do because as a speaker, if you're heckled, you can't speak. So I took my speech and I ripped it up in half very flagrantly. And I got everybody's attention. And I said, how many here believe that Osama bin Laden carried out 9/11? And half of the 1,000 people raised their hands. Then I said, how many of you believe that Israel and the CIA carried out 9/11, and the other 500 raised their hands. Now the question is, what do you do with that because I'm never going to get beyond their reality that 9/11 was a conspiracy by the CIA. And so I'm stuck with that. OK? I have to work around that. I can try to convince them. I can present facts and everything, but if somebody is stuck on a conspiracy, nothing I do can change their mind. SLEN: Steve Emerson, thank you for being on the Washington Journal.